Lot's of user want to control the android smartphone from computer.User want to manage and installed the smartphone application from computer. 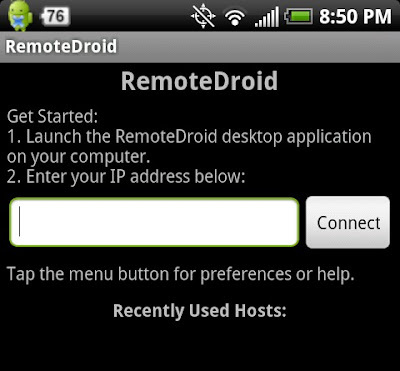 RemoteDroid application will help you to control and manage the smartphone application from computer. It allow user to execute the android application in smartphone by providing command from computer.It turns your phone into a wireless keyboard and mouse with touchpad. It also allow user to run the application like run WhatsApp on PC and Android device simultaneously using same number at a same time. 3.Then open the extracted remoteroid server software on your PC and click remoteroid icon, a firewall setting pop-up will open, allow access to it. 4.Open Remoteroid Application on your android device and click proceed. Now it will ask for SU permission ,grant it then provide the IP address of your connected computer network, provide it and hit connect buttton. How to check the IP Address of computer. 2.Now type CMD in run tab. Note 1: IP Address vary from different computer to different service provider. Note 2: PC and android device should work with same Wi-Fi.